Did you know that hundreds of thousands of people in the United States commute to work by bicycle, according to the U.S. Census Bureau? That’s a lot of cars off the road each day, a lot of gasoline saved and a ton of calories burned. Be prepared. Always check your bike and other equipment before you leave on each trip. Also carry the proper tools and gear (including wet-weather clothing, if needed). Obey the law, traffic signals and signs. You have a right to be on the road with cars, but you also have the same duties. Stay right. Ride with the flow of traffic in the right lane. Leave room to make emergency maneuvers. Be visible. 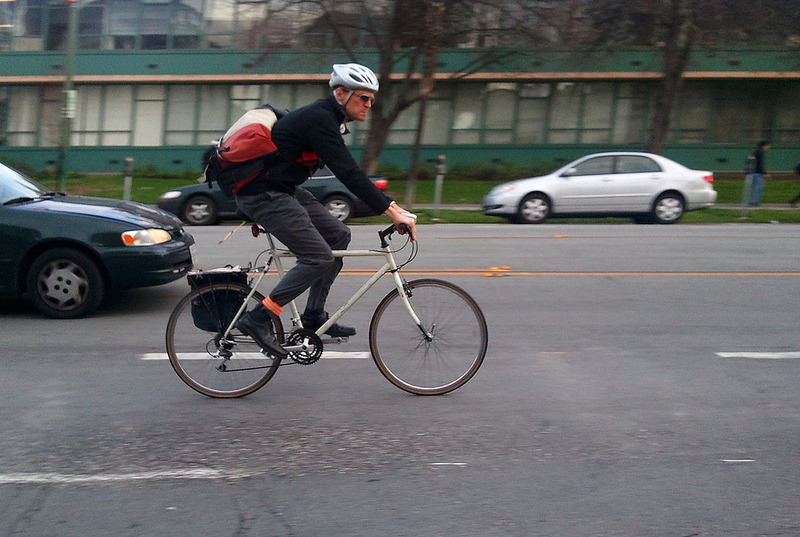 Drivers are often distracted, and many aren’t expecting to see cyclists on the road. So make them see you! Stay out of blind spots. Wear bright-colored clothing during the day, with reflective clothing and lights at night or in inclement weather. Also use hand signals so motorists know your intentions. Consider the conditions. Riding can be miserable when it’s wet, unless you have waterproof rain gear. Watch out for slick roads, too. Be hyper-aware. Scan your surroundings constantly so you can react quickly. Pay attention to cars parked alongside the curb; a door can fly open at any moment. Bonus tips for drivers: Stay on the lookout for cyclists. When you see them, be patient — they have a right to the road, too. If you park on the street, check behind you before opening doors. And, always remember that your significant size and speed advantage can be deadly in an accident. Cars and bicycles can, in fact, peacefully coexist on the roads. All it takes is a little preparation and a lot of awareness, along with some understanding thrown in for good measure. If you’re biking to work, we may be able to help you get a special discount on your car insurance for driving your vehicle less. Call today for details! Top image by Flickr user Richard Masoner used under Creative Commons Attribution-Sharealike 2.0 license. Image cropped and modified from original.